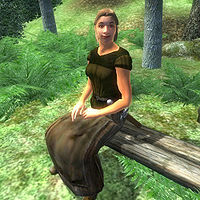 Aviera Nirol is an Imperial commoner who is a devout worshipper of the Daedric prince Vaermina. She can be found with her fellow worshippers at the Shrine of Vaermina. She will spend all her time wandering around near the shrine, at times sitting down on one of the two benches. When you first arrive at the shrine of if you speak to Aviera Nirol before you leave an offering to Vaermina she will callously say "I have seen everything. After you've seen through Vaermina's eyes, nothing can frighten you." Aviera wields an iron dagger and wears lower-class attire consisting of dark green shirt, coarse linens, as well as a pair of clogs. She also carries a few pieces of gold. This page was last modified on 20 October 2015, at 05:16.